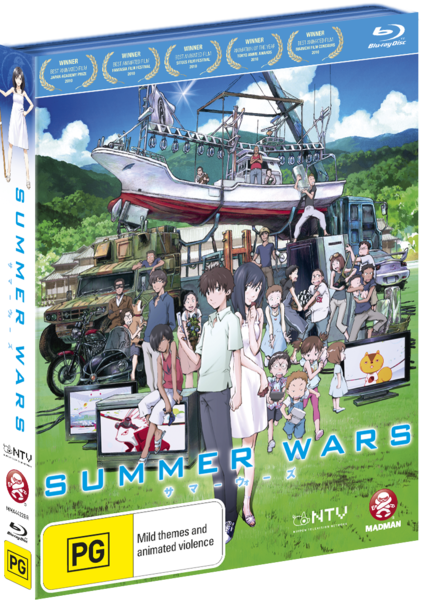 Mamoru Hosoda’s latest animated film Summer Wars comes to Blu-ray this month and the visionary director of The Girl Who Leapt Through Time delivers a beautiful and uplifting film about family and the digital age. Kenji, a math whiz, spends his spare time programming the online sensation OZ. Imagine Facebook, Second Life and every other piece of media rolled into one and you have OZ. The world of Summer Wars is online all the time. The beautiful Natsuki offers him a job; act as her fiancé for the weekend when she returns home to celebrate her grandma’s 90th birthday with her extended family. Kenji accepts and his world is turned upside down when he receives an email with a math problem. The problem unleashes a rogue AI on OZ that starts cannibalizing people’s accounts to grow in power. Soon the AI is threatening the entire world and Kenji and Natsuki must pull together the combined skills of the entire family to stop the AI. Now that might sound pretty much like the description on the back of the box because, well, it is. To explain in more detail the rest of the story would spoil a lot of the enjoyment to be had in Summer Wars, and there is plenty to be had. The story does take a little while to get going with an almost romantic comedy feel to its beginning, Kenji pretending to be Natsuki’s fiancé, but this does allow us to form a bond with Natsuki’s family that aids the film in the long run. It can also be difficult to follow some of the discussion on just what has happened to OZ and how Kenji and the family plan to stop the AI. Plus you don’t want to dwell too long on the fact that Natsuki, supposedly a popular girl, was picking between nobody computer programmers for her fake fiancé. The film deals with a variety of themes, some new and challenging like the idea of a digital society and an overreliance on connected technology to function, and some as old as time, like loving and respecting one’s family, that give the story added depth. It is also this basis in family that allows a film about the often cold digital world to have a lot of heart and warmth. Natsuki’s family is filled with many colorful characters from the 90 year old matriarch who springs in to action to give everyone a good kick in the backside when the AI first takes over and plunges Japan into chaos to the roguish Wabisuke. 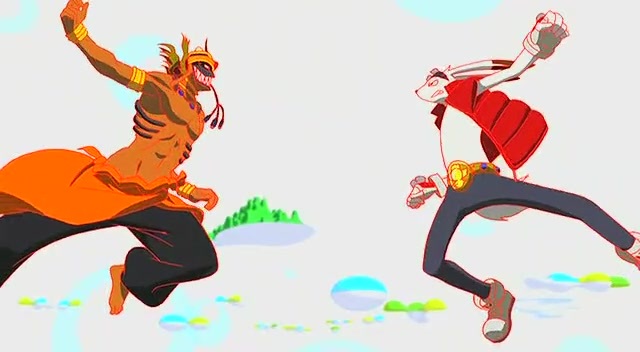 While the family has a prominent role the real star of Summer Wars is OZ. A visual masterpiece that looks even better in crystal clear high-definition OZ is a kaleidoscope of fantasy and color. It’s no wonder everyone, even governments, spend so much time in OZ. It is a truly remarkable world filled with endless possibilities. OZ is also the sight of the film’s impressive action sequences, which are as well executed and as awesome as we’ve come to expect from anime. The real world is also just as beautifully drawn and animated; especially the ancient home of Natsuki’s family, but it has nothing on the magical OZ. Blu-ray really allows the quality coloring and animation to shine through. Both the English and Japanese versions are given the Dolby TrueHD 5.1 treatment. The voicework is solid and the score suitably dramatic and uplifting when it needs to be. The Blu-ray also comes with some pretty standard special features like director and cast interviews, trailers and original TV spots. It’s not the greatest feature package but it’s better than nothing. Summer Wars is only let down by have fairly standard special features. Other than that it’s certainly worth adding to your Blu-ray collection. Its cautionary tale of digital reliance is good on its own, but what really makes Summer Wars a great watch is its message about family and respect.